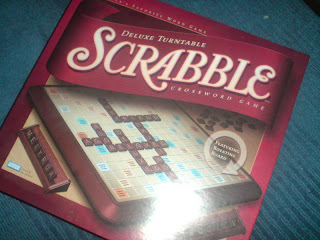 While I never played the facebook game - Bunny and I play real scrabble on occasion. We have a lot of fun because even though we're keeping score - it's not about winning or losing - we mostly try to fill up as much of the board as we can and come up with interesting words. Best discovery tonight? The vertical words grows, piano, and greener fit side by side with the provision of building the horizontal words rare, one, and woe :) I'm going to try that next time we play.